Get 50% more Roses on our standard size! 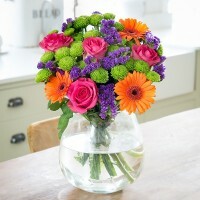 Send a splash of colour to their door with this bright bouquet, perfect for a celebration of any occasion! Please note the bouquet pictured is the standard size and the vase pictured is not included.